UPDATE 7:30 AM DECEMBER 12: Police say 20-year-old Kemar Matthews-Hill of South Chicago and an unnamed 17-year-old female juvenile have each been charged with one felony count of armed robbery with a handgun in connection with the incident on Grace. UPDATE 3:40PM DECEMBER 14: Judge Michael Clancy set bail at $50,000. There have been no arrests and no charges filed in connection with the two earlier carjackings. Our original report from earlier this morning continues below. • CWBChicago has been provided with surveillance footage that appears to show the two carjacked vehicles following a third car moments after the two robberies went down. • A man and a woman are in custody after a third victim was robbed just north of Roscoe Village shortly before 10 p.m. Monday. The offenders were in the process of stealing the victim's parked car when police arrivied on-scene. 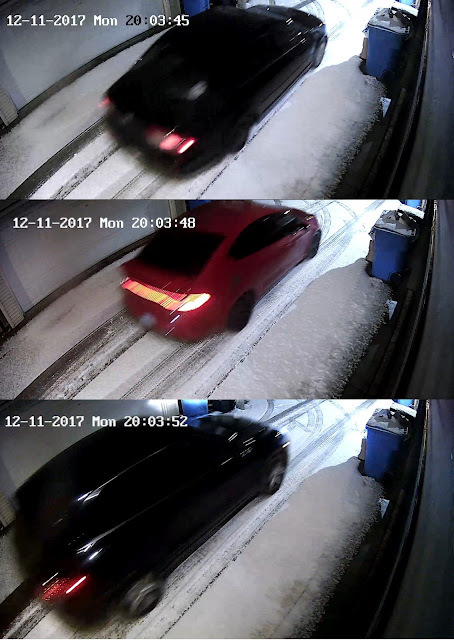 Video shows an unknown car (top), a Dodge Dart, and a Porsche Cayenne. A 37-year-old man was walking in the 2000 block of West Grace at 9:55 p.m. Monday when a man and a woman approached him, pulled out a handgun and announced a robbery. The male offender held the man at gunpoint while the woman took the victim's car keys, wallet, and phone. After demanding to know where the victim’s car was parked, the pair fled on foot. Responding officers quickly learned that the suspects had been directed to the victim’s car, which had been parked near Roscoe and Claremont. Cops swarmed that area and spotted the robbery suspects as they neared the victim’s car. The duo fled on foot, but both were quickly taken into custody. A gun was recovered along with the victim’s property in the 3400 block of North Claremont. Charges are pending this morning. Investigators are working to learn if the detained suspects have connections to a pair of armed carjackings that took place in the Roscoe Village area earlier Monday evening. Just after 8 p.m., a 47-year-old woman was sitting in her Porsche Cayenne in the 3200 block of North Hoyne. An unknown offender wearing a ski mask tapped on the window of the car and displayed a handgun while demanding control of the vehicle. 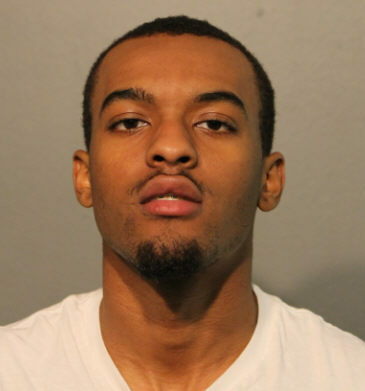 He was last seen heading southbound in the east alley of Hoyne, according to a police source. The offender ditched the victim’s phone near Hamlin Park to prevent GPS tracking, police said. The car is a 2011 model bearing a license plate that begins with K911. Less than five minutes later, a 25-year-old man walked into a wine store in the 2200 block of West Roscoe asking for help after he was carjacked in the 3300 block of North Bell. Once again, the victim said he was sitting inside his car when two men opened the doors on both sides of the car and ordered him out at gunpoint. The robbers covered their faces with scarfs and both brandished handguns as they took the victim’s red 2014 Dodge Dart and fled south. The car has a gold racing stripe on the side; gold and black rims; and a license plate that begins with AJ693, according to sources. Police said the known carjacking offenders are all men in their early 20's, black, wearing ski masks or scarfs over their faces. The gunman on Hoyne is about 5’10” tall, has twists in his hair, and was wearing a red and white letterman-style jacket. He had a blue steel handgun. His ski mask has detailing around the eyes and mouth. On Bell, the suspects are about 5’9” tall and both wore gray or black hoodies with writing on the front. Early this morning, a CWBChicago reader provided surveillance video that shows an unknown car being followed by a red Dodge Dart and a Porsche Cayenne through a Roscoe Village alley moments after the carjackings. The video, posted above, has been provided to investigators.